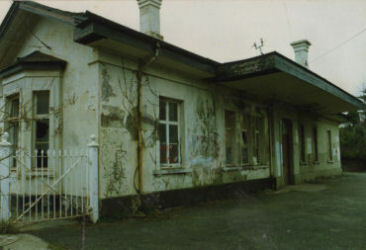 The beginning must start in 1992 when we bought St Germans railway station as a derelict wreck and got planning to convert it into a house. It came with an overgrown parcel of land where we are sitting in the above right pic blissfully unaware that in 1994 we would find a platform edge beneath us and have an exploratory dig. 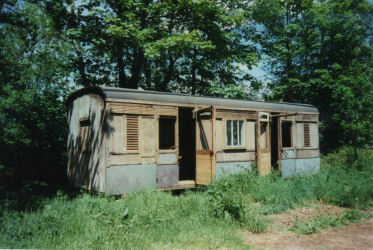 On discovering a siding we decided to search for a coach body to go on it as a guest room for visiting friends. 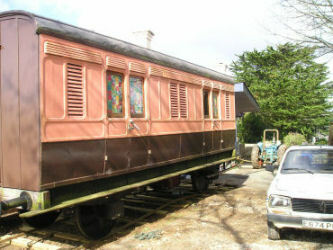 After a while searching, and missing out on a Victorian carriage we really liked at Liskeard station (that's another story ...) we found the Old Luggage Van in a builder's yard in Liskeard in 1996. 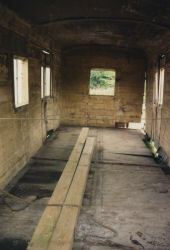 Fairly derelict but essentially complete, one of the bottom rails had rotten, and so the floor and side on one side were unattached, so it had to be secured carefully when we moved it. 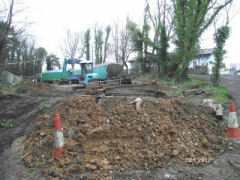 For over a year we worked on it at a site near Trerulefoot. 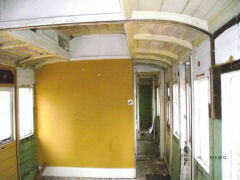 We began by stripping the paint inside and out. We were glad to have the assistance of our friend Mark, who was a specialist in fitting out Comby vans. 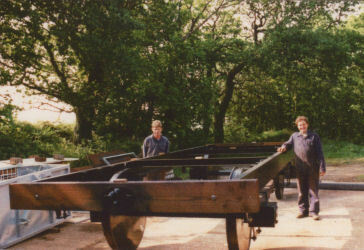 Dave and Steve created a chassis modelled on original drawings. 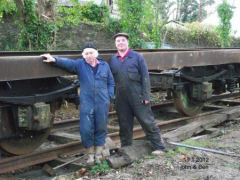 We were very grateful for the help of Gordon Weddell, author of LSWR carriages published by Wild Swan publications, for all the invaluable information he gave us. 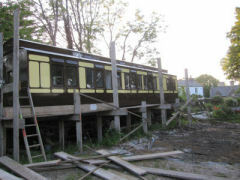 The siding was excavated. 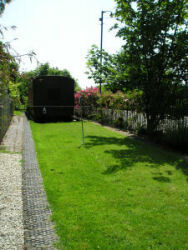 Because it had been used for cattle the rail had been concreted in for easy cleaning so we were delighted to find the track still in place. 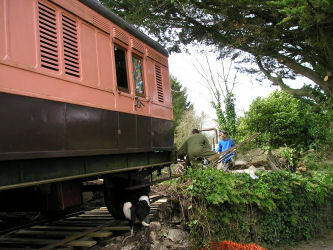 Fairly soon after moving the chassis we were able to take the Old Luggage Van to St Germans. 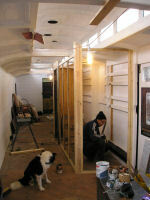 The inside was again carefully strengthened, but Dave has done the work to the bottom rail so we were more confident the move would be successful, which it was. Little were we to know it would be the first of many more! 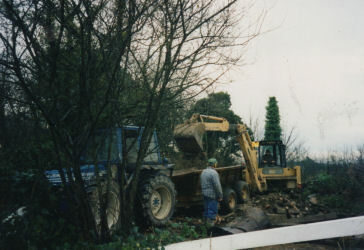 Once in St Germans work continued apace, through the summer and autumn of 1997. 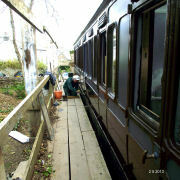 By the winter we'd completed much of the work, and taken advice on a colour scheme from the wonderful Gordon Weddell of LSWR carriages fame. We ordered new leather straps for the window from a local leather worker and retained all the original features we could, including the interior perforated zinc panels and exterior door handles. 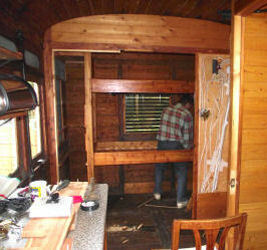 The inside was Danish oiled and looked lovely, a job that we repeat each year. 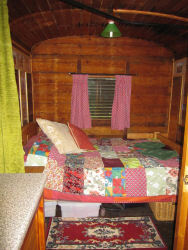 The finished Old Luggage Van was fitted out to sleep families of up to four (although we did occasionally have brave groups of five!) 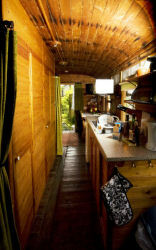 It had a seat that converted into a double bed or two singles, a separate shower and toilet, two bunks and a small lobby. 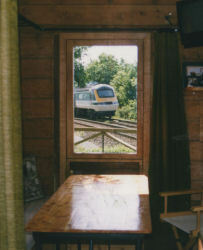 We advertised in the Railway press and in July of 1998 welcomed our first guests. 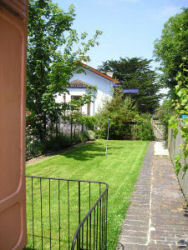 The garden was simple and we felt very much like novices. 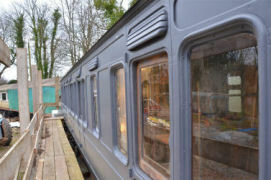 However when word got around on what a great place it was to trainspot we soon got good publicity and a healthy flow of bookings; appearing in The Times, Home Building and Renovating Magazine, local papers and on BBC breakfast news. 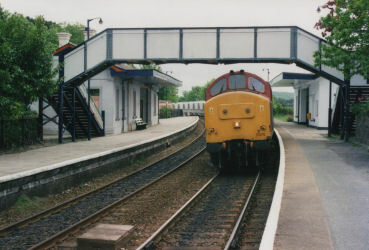 These were the days when class 37s were still in mainline service and the Post Office train sped by twice a day. 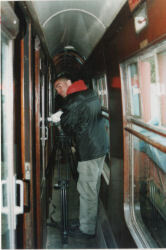 In January 1999, six months after opening we were delighted by the arrival of Walter, who was born in St Germans station and quickly developed a passion for trains. 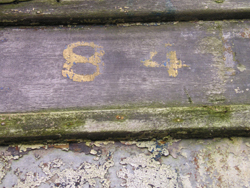 And so began our education in engine numbers and the names of Thomas the Tank Engine and all his friends! 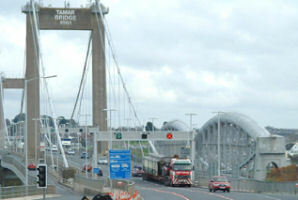 The business continued comfortably, we expanded with the SK2 at Hayle in 2001, while expecting our daughter Poppy. All was delightful and easy until we had the idea of expanding further in St Germans. 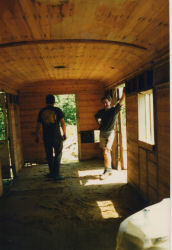 We searched for a thirty foot coach, but fell in love with the 48 foot long Travelling Post Office, which was far too big for the site we were preparing to lease at the other side of our station building. 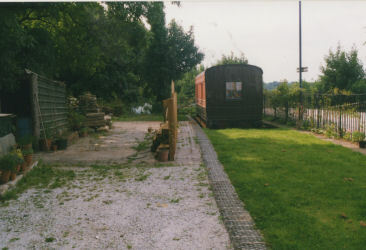 After much head scratching and a reluctance to change what was a successful arrangement we finally decided to move the Old Luggage Van to the new site, to free up the siding for the Travelling Post Office. 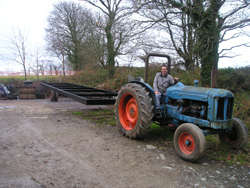 This fun move involved pulling the carriage behind our 1952 Fordson Major tractor, adding a few feet of track in front of the carriage with each pull, and a day doing something technical with rollers to line it up into the right position. 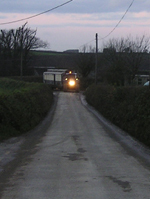 This was in the spring of 2006 and just to add a little theatre the new rail franchise had come out, threatening to cut the services at St Germans from 12 each way to 6. We ran a successful campaign to overturn this, but perhaps our most surreal moment of the business must have come when Lizzy was interviewed on the television for the local news and the subject of the holiday business came up. 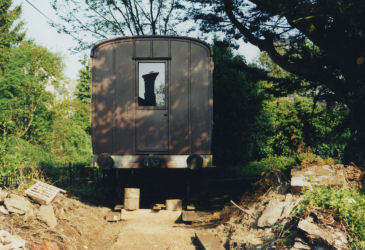 The Luggage Van was parked in front of the house behind Lizzy, while Dave and Lizzy's cousin Malachite walked back and forth with sleepers like a pair of burglars! 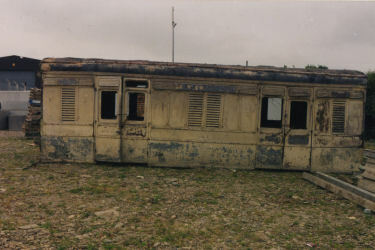 While the Luggage Van continued to be popular, we felt after the advent of the grander TPO that it slightly fell into its shadow. As our first venture, we'd wanted to sleep a family of four as we felt this would offer the most possibilities, which it at the time it did, and we made many close friends and watched their children grow. 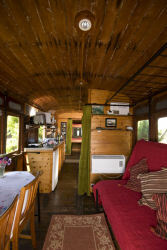 However now we felt with families well catered for we would be better to adapt it as a retreat for singletons and couples, taking advantage of the cosy garden and the line side view. 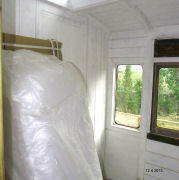 Again after much soul searching in November 2011 we upgraded the Luggage Van. 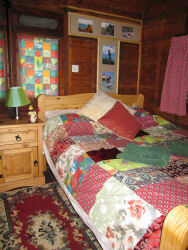 We began on the bedroom by taking out the bunk area, rewiring the electrical cables, ordering prints to decorate the walls and making a patchwork throw. We bought the most comfortable mattress we could find and added a decorative curtain rail around the area to make it extra cosy. In the sitting room we removed the old sofa bed arrangement and found comfortable fireside chairs to go with the wonderfully effective wood burning stove that Dave made from an old gas cylinder. We finished the look with an Edwardian side table and new lampshades, that we later replaced with glass shades to add a more authentic railway look. 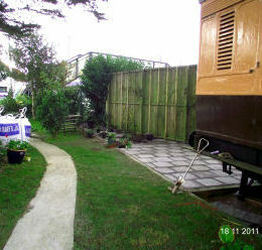 Grass had always struggled in the Old Luggage Van garden, as the impressive macrocarpa tree keeps the soil dry and often shaded. 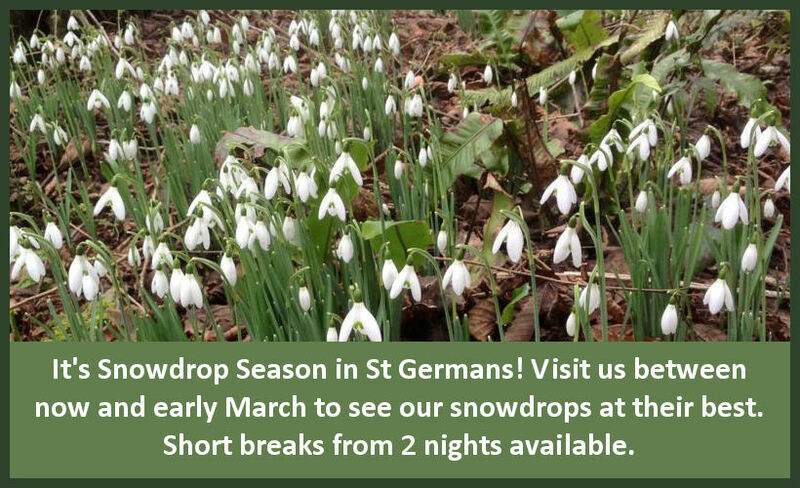 We added a patio area interspersed with a fine mix of perennials and shrubs for all year round structure and interest and filled the lawn with spring bulbs. 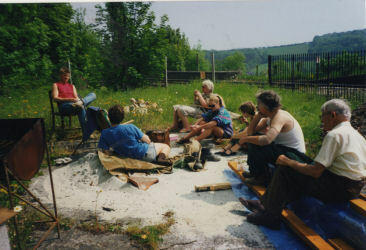 We were ably assisted in our work by Lizzy's sister Nic, Dave's father John and our friend Lil, who proved to be a fiend at laying patios. 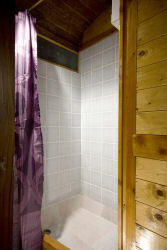 This renovation was a great decision and 2012 has been our busiest season yet. 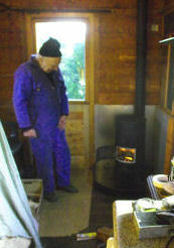 The garden was completed with our log shed, so our guests need never worry about running out of fuel. 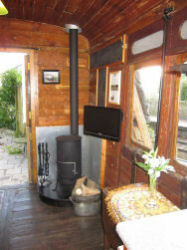 We are hopeful now the Old Luggage Van is finished we can enjoy watching the camellia filled garden maturing, sit back and relax! 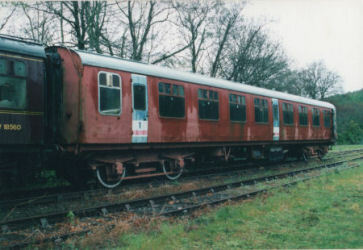 Harvey is a BR Mark 1 Corridor Second coach built in 1957 at Wolverton carriage works to diagram number 146. Its first number was 25355 of lot number 30349. 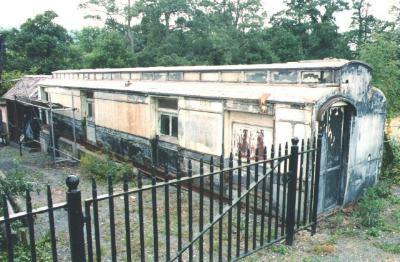 Taken out of service in 1983 it was purchased by a private buyer who began the external restoration on a siding at the Bodmin and Wenford railway. 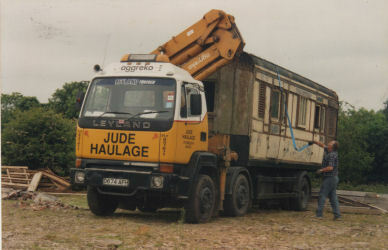 We bought it in 2000 and converted first the West End, which was the subject of a five part programme on Discovery Channel called Amazing Conversions, a Wall to Wall documentary. 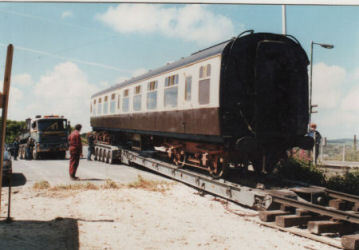 The coach was completed and moved to Hayle in July 2001. The following year we converted the East End. 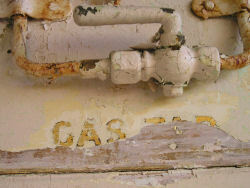 Internally we were able to retain most of the original features. The seats were re-upholstered in 2012 with the original Trojan Blue mocquet. In 2013 we changed the name from 'The St Ives Bay SK2' to 'Harvey', which is a nod to the world famous foundry, Harveys of Hayle, the builders of Richard Trevithick’s first locomotive engine. 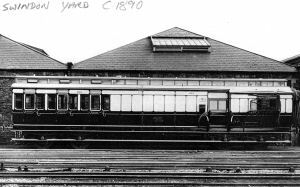 Our 1889 GWR clerestory roofed travelling post office number 841 ( built as number 2086 ) originally had broad gauge bogies and a narrow body. 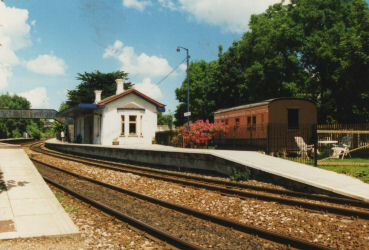 It was converted to standard gauge in June 1891. 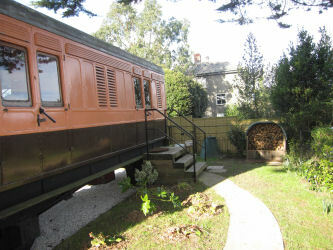 It was withdrawn in 1934 and for many years formed part of a house in Wales. 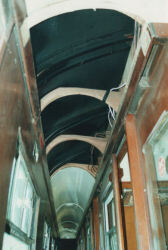 The internal view is of TPO 838 which appears to have been the same internally as 841. 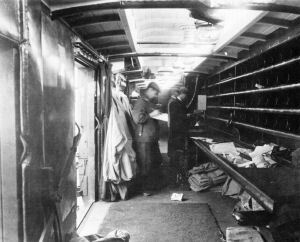 The photo was taken on 9th January 1900 just as more mail has come aboard the 'up' Bristol-Penzance TPO. 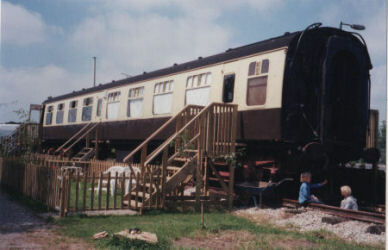 The external view is not TPO 841 but is included to show how it would have looked as built with 3 third class compartments at one end. 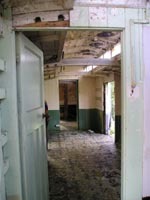 Whilst we were replacing some panels the original door frames could clearly be seen. 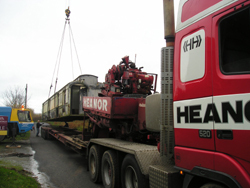 12th November 2004 - Cranes in Wales and Cornwall and a low loader from Moveright International are booked so the TPO should be with us in St Germans on Wednesday 24th. 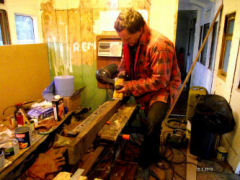 In preparation for this, work on the chassis has been progressing at a frantic rate. 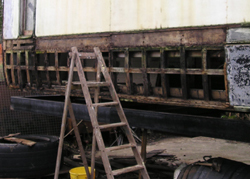 The plan is for the chassis to have a temporary road axle and drawbar so that the TPO can be moved onto its site by tractor once the conversion work is complete. 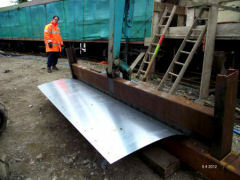 It will be fitted onto the bogies on site. 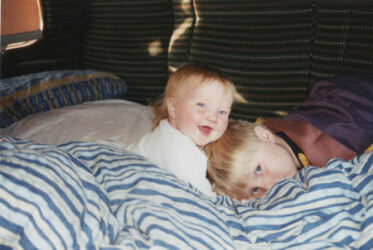 26th November 2004 - Well we made it! 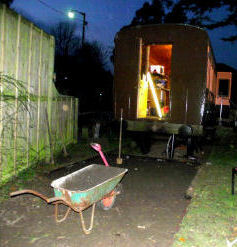 The TPO is now parked outside my workshop but along the way we had a few trials and tribulations. 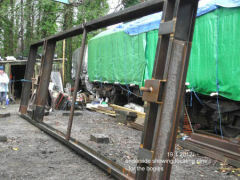 We went to Brecon on Monday to jack it up from the steel frame that it was resting on in preparation for getting the strops around it. It was only possible to jack at one end but it is very rigid and didn't sag at all. 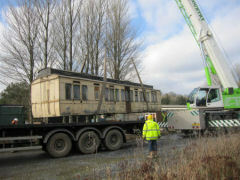 Tuesday AM saw a 50t crane from Jay and Davies of Hereford and the low loader from Moveright/Heanor arrive. 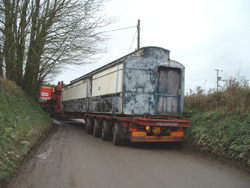 It took only minutes to lift the TPO onto the lorry but then a slight problem loomed in that the trailer at 80' long was too long to turn and so it was necessary to reverse the 2 miles back to the main road! 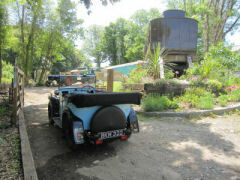 The lorry arrived in Cornwall the next day and things would probably have gone smoothly had it been able to get around the corner before the proposed site for unloading. After an impromptu change of venue and another half a mile of reversing the TPO was successfully transferred to its new chassis. 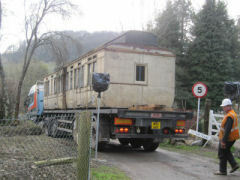 It was then moved by tractor to the workshop. Quite a draining couple of days! 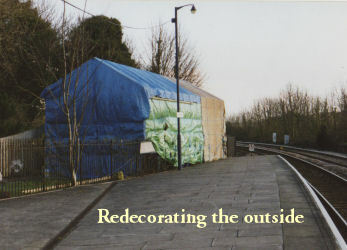 10th December 2004 - The first priority has been to get the tpo weather tight as the original canvas roof covering had gone. 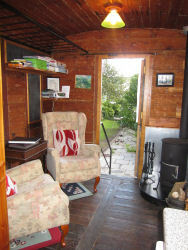 The roof structure is single skinned 1" timber and so insulation was used under the roofing felt to help reduce both heat loss in the winter and gain in the summer. 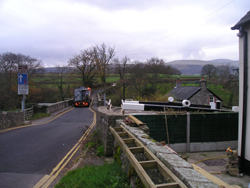 February 2005 - We have had a couple of dry weeks and so the emphasis has been on the outside. 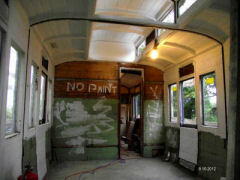 The clerestory windows have been sealed around and painted which seems to have stopped the few leaks that we had. 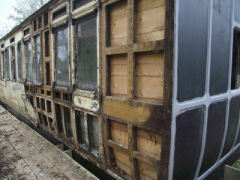 New glass has been obtained for the broken windows. 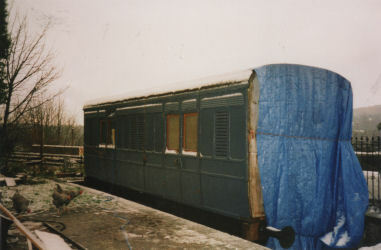 Standard railway practice was to replace the mahogany outer skin panels with galvanised steel sheets and this has been done to most of the TPO. Some of these were coming away from the frame work and so they were replaced. 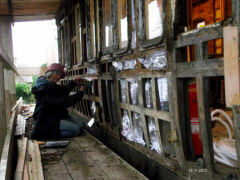 The new panels were taken up under the top ones to prevent water ingress instead of butting together as before. 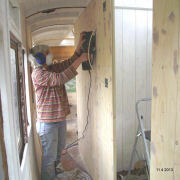 In due course mouldings will be fitted. 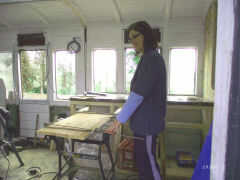 I have made these before for the luggage van from marine ply which seems to work well. A new section was scarfed into one of the ribs. 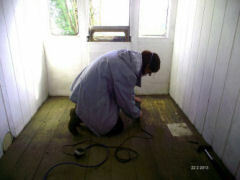 The floor in some areas has rotted and is being replaced. Originally there were 2 layers of opposing diagonal boards. Plywood is being used for the under layer with new t&g for the top layer laid diagonally as before. Getting the new areas to blend in with the original will be a challenge. November 2005 - OK so I've never been much good at keeping a diary but here is the belated latest instalment! 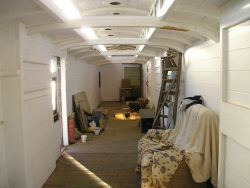 The inside has been completely stripped, repaired and primed. 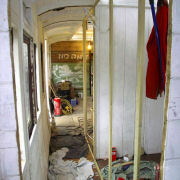 The 2 (non original) partitions have been removed and the floor re-laid with diagonal boarding stained to match the 2 original sections. One new window droplight has been obtained from our local joiner. 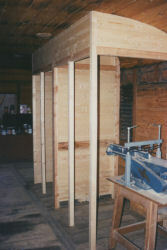 January 2006 - The wc/shower room is complete except for tiling the shower tray and a bit of plumbing and the bunkroom is finished but needs a couple of doors. The double bedroom is finished except, again, for a door. I feel a door making session coming on! 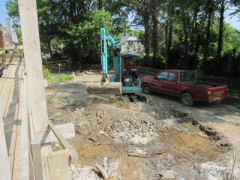 Work is currently progressing well on the kitchen. 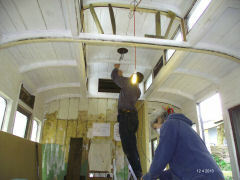 The schedule at the moment is to have the wiring done within the next couple of weeks, with the internal work finished by the end of February. 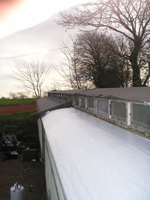 Then move the TPO undercover for a couple of weeks to sort out the outside. 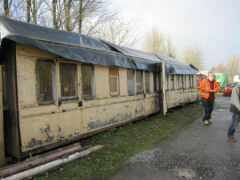 Then move it onto site mid March. 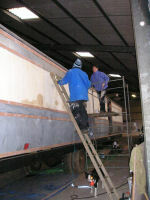 February 2006 - The TPO is now undercover in a large grain shed so that we can work on the outside. 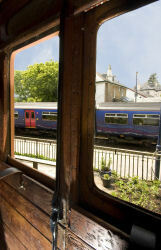 After repairs and panel replacements, mouldings to the original pattern are made from marine ply and fitted. Internally things are pretty much complete and the wiring is underway. Still no doors yet though! 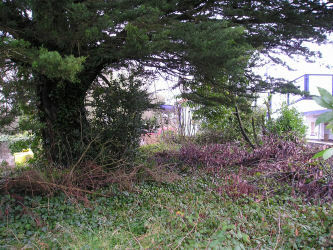 We acquired Mevagissey in November 2010. 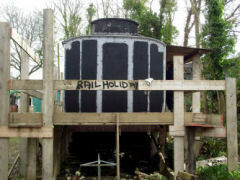 It was at Buckfastleigh on the South Devon Railway, where it had been stored for many years. 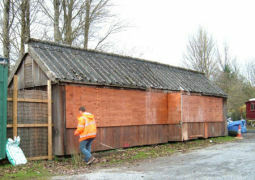 Clad entirely in cedar with a pitched roof, there was nothing to indicate this shed was a carriage. 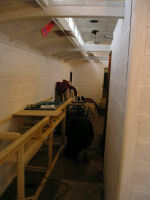 Inside it was clad through out with hardboard and carpeted. It was a little damp, but essentially sound. 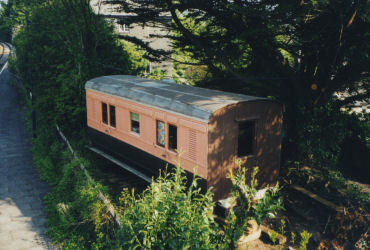 After being taken out of service in the 1930's it had been used as a house in Mevagissey, hence the name, and had moved twice before being stationed at South Devon. 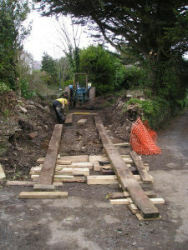 There was plenty to do on site before we were ready to welcome Mevagissey to St Germans. 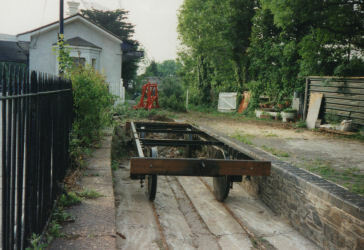 Wheel sets were acquired from Plym Valley Railway and a chassis was created for the coach to sit upon. 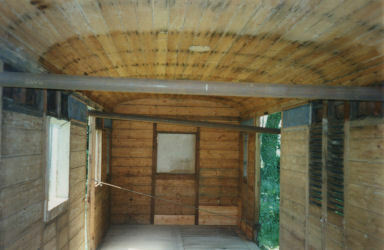 The siding was extended and built up. 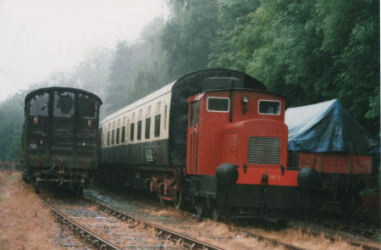 There was plenty of shunting of carriages up and down the line in anticipation of the new arrival. 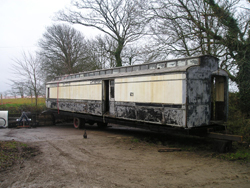 In February 2012 we were ready to move the coach. 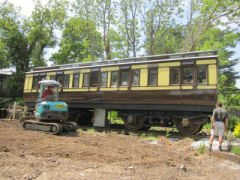 As is the way with coach moving, it was always unlikely to go exactly according to plan! 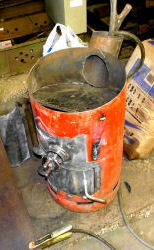 It was an extremely cold February day with very hard frosts. 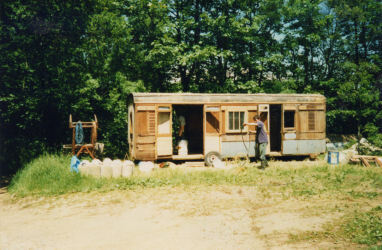 We arrived early to get ready for the trailer, which was due at 9.30. 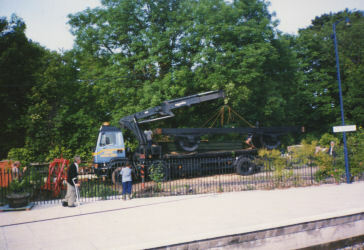 The crane was there by eight and all was going swimmingly until the lorry failed to materialise. It turned out his brakes had frozen solid and another lorry had to be tracked down, which finally made the scene at midday. We were very grateful to the friendly staff at Buckfastleigh who kindly showed us around their fascinating engine works room. The warm cafe with home made cakes was also much appreciated! After that things went well - the drop off at St Germans went without a hitch and we were able to celebrate what we anticipate will be our last carriage move! 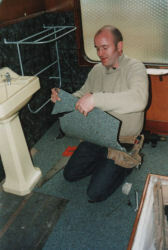 Once in St Germans, John set to removing the carpets and hardboard from inside the coach, while Dave and the team were busy ensuring it would be watertight. 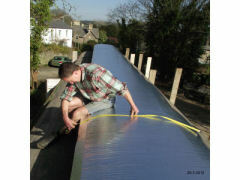 The roof was clad with galvanized steel sheet, which involved Dave in the creation of a special bending machine. 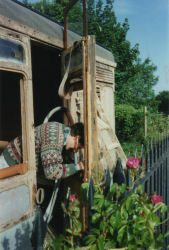 A temporary platform of reclaimed scaffold boards was erected around the coach so work could be carried out more easily. 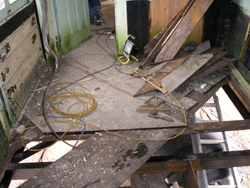 Once the roof was watertight, the team set to on the outside, replacing the rotten panels and renewing the mouldings, taking the opportunity to insulate in every possible cavity. 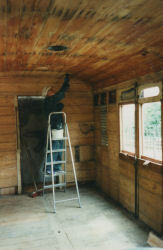 Meanwhile John began a task that would keep him busy for the next seven months - stripping paint and sanding back the woodwork. 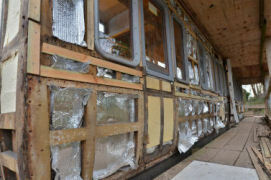 And so more panels off, more insulation in. 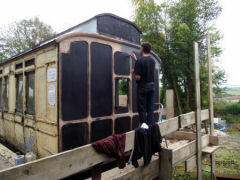 Some parts of the outside work are more challenging than others - notably the curved wooden beads at the end of the coach. 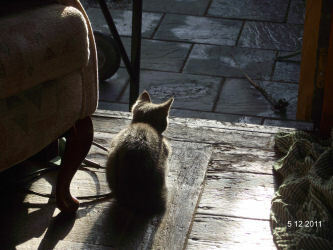 2012 has not been a year in which sunshine featured highly. Consequently exterior work was somewhat hampered by a lack of break in the clouds. 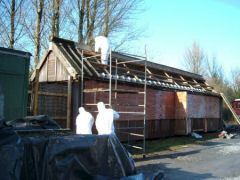 However whenever the sun was out the panel replacement and exterior work continued apace. In the autumn the team erected a canopy to help stave off the worst of the weather and while we had been optimistic that the external work would be complete by the end of the year rain has slowed play and so although the majority of the outside has been done by January 2013, it will be continuing into the New Year. 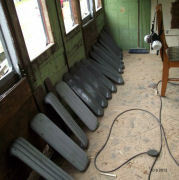 In October 2012 Dave began work on the drop light windows, a time consuming task that will provide many weeks entertainment. 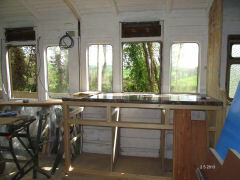 The fixed window panels are stripped off and done up, window latches and hinges fitted up, brass work polished. 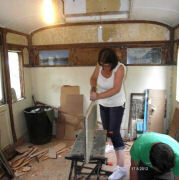 The mouldings were taken out of the first class compartment and sanded down ready for the next stage. 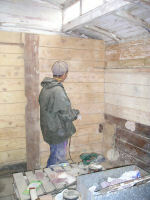 John was delighted to finally down the sandpaper and pick up a paintbrush. With this marks the beginning of a new phase - with most of the internal restoration complete, the fun job of fitting up can now begin. 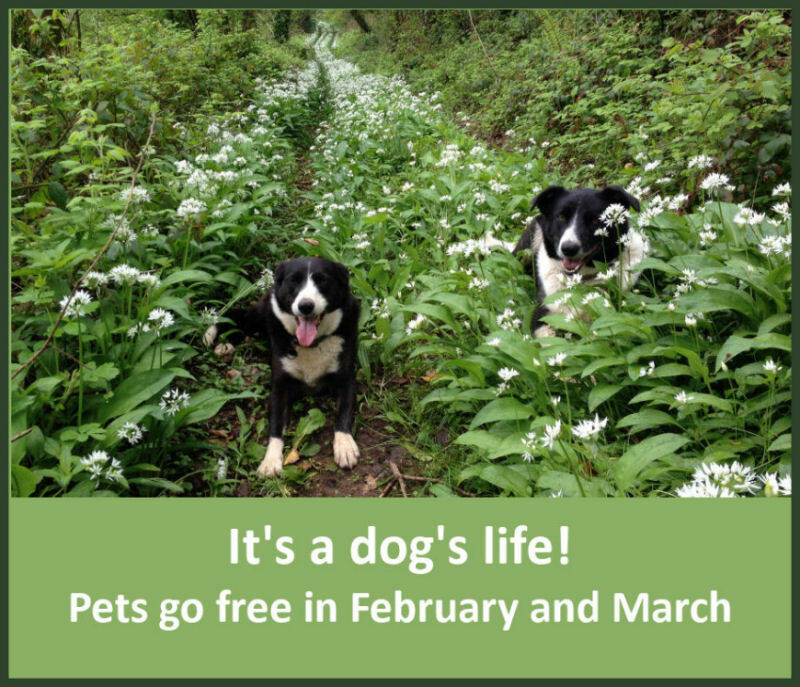 Roll on the summer! 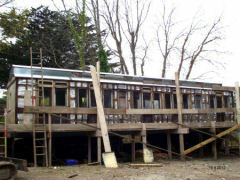 Much of February 2013 has been spent on renovation - completing insulating the exterior, adding the panels, making the mouldings, grouting and filling the gaps. 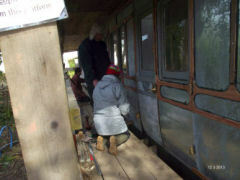 Dave has fitted up the doors (a job that has been larger than it sounds!) 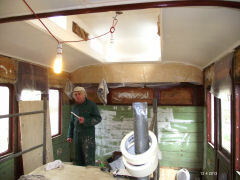 We've also been filling and sanding inside. 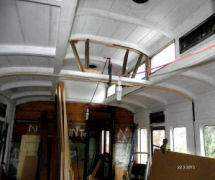 March 2013 and the first class compartment is now well underway. 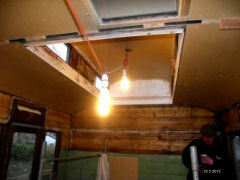 We have put up the ceiling panels and the mouldings. 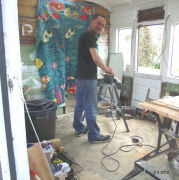 Ben has added panelling in the old toilet areas and on Friday our upholsters, Selina and Paul Luscombe of Luscombe Upholstery came to test out their templates, so the bed and side panels will be complete by the end of the week, then stored until we are ready for them. 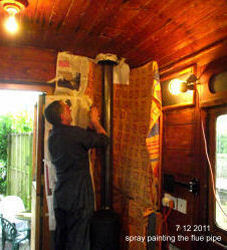 They also took away the curtain material and will be creating the curtains in the next few weeks. The choice of upholstery material took a fair bit of mulling over - but in the end we are delighted with what we have got, which for both first and second class is really sumptuous and in keeping with the character of the coach. Carpet choosing is underway and today a friend is coming over to teach Lizzy how to guild the mouldings. 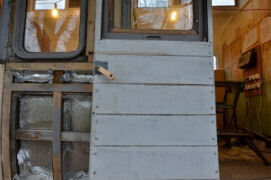 The outside is now complete, except for the final coat of chocolate and cream paint. 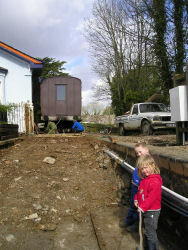 The channel has gone in for drainage and the garden is underway. 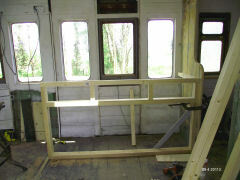 The children's bedroom is awaiting the bunks, which are being made by Paul Ager, who is also creating a signal box play house for Hayle and bespoke luggage racks and curtain poles. 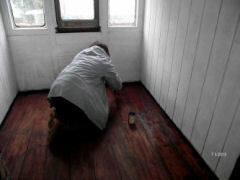 The bathroom floor has been filled, sanded and Danish oiled. 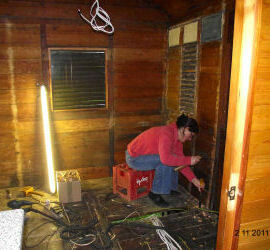 We've chosen the panelling and are now contemplating light fittings. 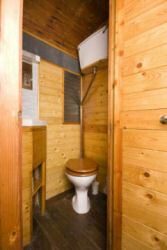 The bath is waiting to be fitted and we plan this week to choose the sink and toilet. April - The bathroom has moved forward really well from being an empty room to a fabulous light space with respatex panels, high rise cistern and bath with ball and claw feet. Just waiting for the plumbing so we can use it! The wiring has gone up in the living area and the bedroom and living room furniture has been made and is awaiting our command. We've decided to leave fitting it for as long as possible to ensure it stays immaculate. We wanted to recreate the beauty of the 1st class compartment, so with the wise guidance of Sarah, a gilder who now runs Essential Decoration Lizzy's been playing with tissue thin sheets of pure English gold. It's been a learning curve, but we are pleased with the results. May and the team have been working with all hands to the deck - we're really pleased (relieved) with the progress we're making. 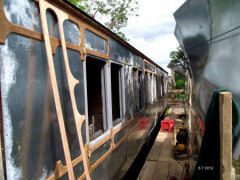 As I write (7th May) the 1st class compartment has gilded panels and most of the painting complete. 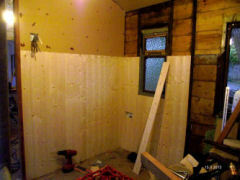 The bathroom is almost finished -just awaiting decorative brackets for the cistern and a shower curtain rail. We were delighted to find a curved towel rail to fit into the small space allocated, and it looks very stylish. 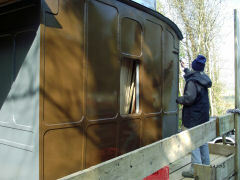 The sunny weather has enabled us to give the outside two coats of brown paint. Dave and Nic have now moved on to make a really good start in the kitchen, while John restores the doors, Kath sands and fills and Lizzy sorts out the finishing touches. June 4th and work is so busy there's little time for blogging! Mevy is now a beautiful cream and brown. 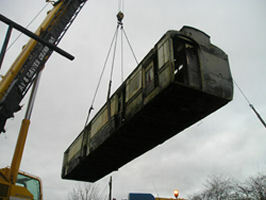 The top vents are going on ready for the move to its final position. 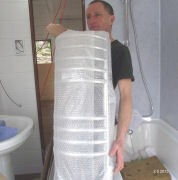 Our electrician Richard Elliott and plumber Mike Eastment have both been hard at work this week adding the services. The gilding in first class is almost finished, save a little around the picture frames, which will be finished later this week. The garden now has a beautiful hazel fence and we've put in the gate and later today will add fencing panels to complete the garden. Our talented blacksmith friend Paul Ager has measured up for the bespoke beds in the bunk room and will be making them later this week. John is fitting up the doors and in two weeks the bespoke furniture for the bedroom and living room will be fitted by Luscombe Upholstery. 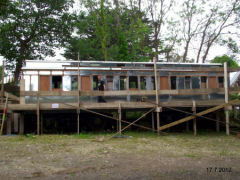 It's looking good, but we won't be resting on our laurels until our first guests arrive on the 5th July! June 10th and less than four weeks to go - the countdown begins! 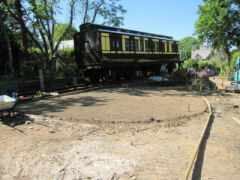 It's been ground force here the last few days - so much progress I'm exhausted just thinking of it! 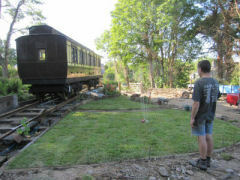 The carriage is now in its final resting place, the ground has been levelled with the kind help of David and Emma Lock, who have been absolute stars this weekend, and the turf is laid. The fence is begun, the entrance planted and mulched. 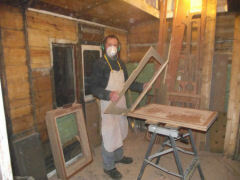 John's making a lovely job of the internal doors and has sanded and varnished the table to go in the bedroom. 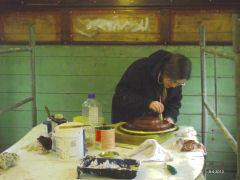 Lara has caulked the guard's room and begun painting and Kath's been on ceilings. The ventilators are on and we're hoping now we've removed the scaffolding we won't notice something we might have missed! July 15th - Well we just about made it for July 5th! In the week before all our kind family and friends pulled out all the stops. 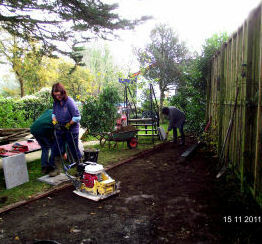 The garden was levelled and laid by our good friends Dave and Emma Lock. 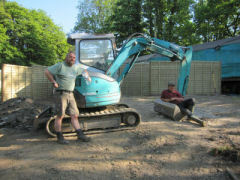 Dave also was fantastic in putting up the fence panels, decking posts and lots of other garden work. Emma's sister Katy came over with a beautifully hand painted sign and made a path through the garden. 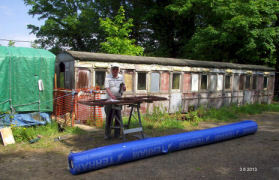 Lizzy's father Tony Lister did some great fencing work and Lizzy's Mum Frankie Lister helped with the patchwork throws. 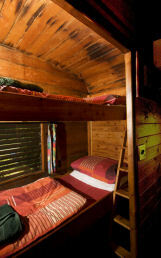 Paul Ager arrived with the most magical triple bunk bed. Ben came down specially from Immingham with his very helpful girlfriend Melissa and laid the tarmac and helped get the decking up, along with Claire, who gave up her Sunday to help us. Thanks to Richard Elliott for the electrical work and Mike Eastment for the plumbing. 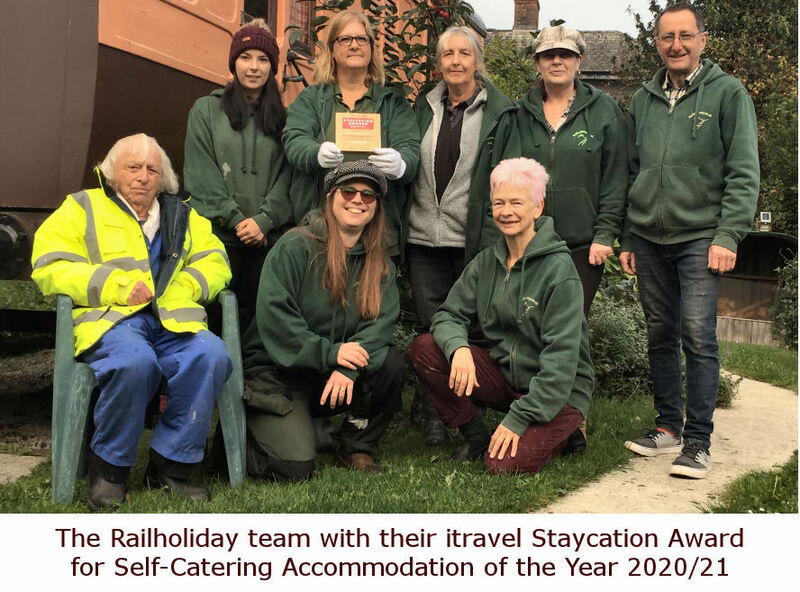 However none of this would have been possible without Lizzy’s ever competent and reliable sister Nic and Dave’s father John, who have been the backbone of the team from the very beginning. 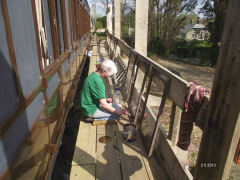 On the Friday there was much last minute polishing and nailing - we had a full team gratefully augmented by our master painter and Tai Chi coach Kath, who passed with friends and concluded we needed an extra pair of hands to clear the deck (literally) that was several feet high in discarded boxes and power tools. Our guests arrived to a scene of much busy-ness. 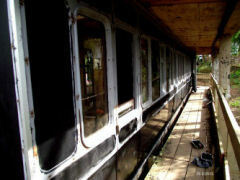 Poppy cut the ribbon and Mevy the Slip Coach was formally declared open!